A Pizza Hut restaurant is seen in New Orleans, Dec. 15, 2016. Pizza Hut is fusing two of America’s favorite pastimes — pizza pies and pickup trucks — in a bid to cut delivery times as fast-food competition heats up. As part of the restaurant’s latest partnership with Toyota Motor Corp., Pizza Hut has unveiled a robot-operated mobile pizza factory in the bed of a modified Toyota Tundra. The prototype will use automated technology to cook pies on-the-go in six to seven minutes, letting the chain expand its delivery area without the pizzas getting cold. The chain, a unit of Yum! Brands Inc., is aiming to turn around its lagging delivery performance and reach customers beyond their sit-down destinations. 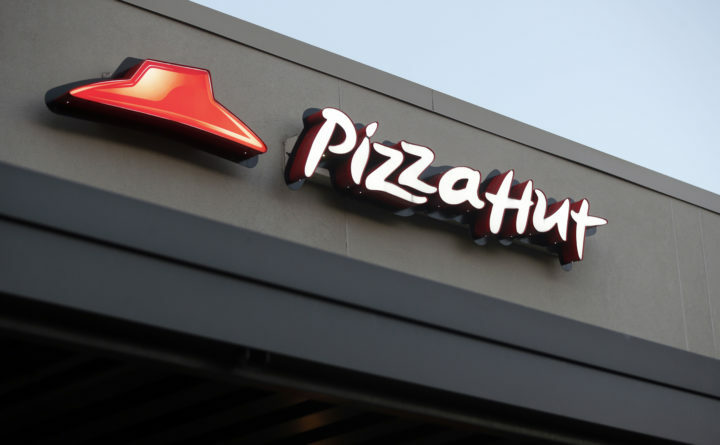 It has been a tough road so far, with Pizza Hut logging a surprise drop in same-stores sales during the second quarter. It reports results for the latest quarter on Wednesday. There’s no target date for the robotic pizza-maker’s debut, Burquier said. Pizza Hut’s announcement comes on the heels of a January deal to join Toyota’s mobility alliance that’ll develop fully autonomous vehicles. However, the hydrogen-powered Tundra used in the partnership will not be self-driving, Burquier said.